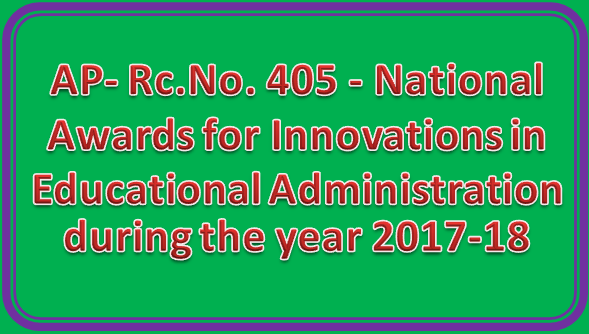 Sub:- School Education - National Awards for Innovations in Educational Administration during the year 2017-18 conducted by the NUEPA, New Delhi scheduled to be held in New Delhi during January/February 2018 — Request - Regarding. Read:- 1. F.No.01/EAD/NAIEA/2017 - 2018, dt: 03-08-2017 of Professor N.V. Varghese, Acting Vice-Chancellor, NUEPA, New Delhi. Kumar Suresh, Head, Department of Educational Administration, NUEPA, New Delhi. District Educational Officers in the State is invited to the references 2nd and 3rd read above, wherein they were requested to send best nominations of the District Educational Officers/Dy.Eos/Mandal Educational Officers, who have made remarkable innovations in educational administration with all details in the prescribed format, from the respective Zones/ Districts by hard and soft copies on or before 10-10-2017 to this office. But no information is received from them so far. Therefore, all the Regional Joint l)irectors of School Education and District Educational Officers in the State arc once again requested to send best nominations of the District Educational Officers/Dy.Eos/Mandal Educational Officers, who have made remarkable innovations in educational administration with all details in the prescribed format, from the respective Zones by hard and soft copies on or before 27-10-2017 to this office, so as to enable this office scrutinise the same at State Level and the selected Best Practices at State Level will be furnished Lv NUEAPA for consideration of National Awards for the year 2017-18, as the GoI is pressing for want of the same in the reference 4th read above.